The owner of a London office building negotiated a lease with a company that wanted all eight floors. To his surprise, his bankers at ING Groep NV shot it down. ING balked because a single tenant, WeWork Cos., would be responsible for paying all the rent. And the Dutch bank isn’t alone. Increasingly, lenders in Europe are cooling toward the co-working giant, which started with six floors in a tenement-style building in New York’s SoHo district nine years ago, and now has 45 million square feet (4.2 million square meters) of office space around the world. For context, that’s nearly equal to all the office space in downtown Philadelphia. A representative of ING declined to comment on the London loan decision. The rapid rise of WeWork coincides with major changes in the way we do business. The company has cashed in on the gig economy, with its demand for flexible, short-term work space. Its focus on casual, funky design chimes with the spread of urban hipster culture, which even blue-chip companies now want a piece of. Many startups, flush with venture capital, have found that WeWork’s offices are a good fit. As it helped transform the commercial real-estate market from Boston to Bangkok, WeWork caught the eye of SoftBank Group Corp. The Japanese conglomerate first put money into the company in 2017, and has committed more than $10 billion to date. After its latest investment, WeWork announced a valuation of $47 billion. WeWork is now partly a victim of its own success. It’s already the biggest private occupier of commercial real estate in London and New York, and some banks in Europe say they are reluctant to build up more exposure to a single company. Its business model— locking in space on long-term leases, then filling it with short-term tenants—has been hard for others to embrace. Even SoftBank’s backing has a downside. In January, it put an additional $6 billion into WeWork, but backed away from a plan to spend $16 billion for a controlling stake. That decision spooked some lenders. “When you have an investor saying it’s going to commit massive amounts, and then the reversal is so great, you would naturally be concerned about what has gone on to cause that,” said Simon Brooks, co-head of structured property finance at Investec Plc, a real estate lender that has financed two WeWork buildings in London. WeWork executives acknowledge that they have to build up their relationships with banks. After all, the company loses a lot of money -- $1.9 billion last year. Its $702 million bond has a junk rating. Granit Gjonbalaj, WeWork’s chief development officer, said the company is “continually strengthening” those ties. “The more we engage with them, the more they realize the positive impact that WeWork is having on real estate,” he said by email. But Vice Chairman Michael Gross disputed the premise that lenders are shying away from the company. “There’s been a tremendous amount of deal flow where assets have gotten resold or refinanced with WeWork as a major tenant,” Gross said in an interview. As this track record grows, “it gets easier and easier for us.” The company hasn’t made big changes to the guarantees or tenant incentives it offers in an effort to appease lenders, he said. The risk is that if more banks follow ING’s lead, WeWork could struggle to keep up its rapid expansion in Europe. Worldwide, the company lists 630 locations in 30-plus countries. This rate of growth is an important basis of the company’s high valuation and sets it apart from its competitors. For example, IWG Plc, owner of the Regus serviced office brand, has a market capitalization of just 2.2 billion pounds ($2.9 billion) despite having more locations than WeWork and making a profit last year. London is the world’s biggest city for co-working, making it a prime market for WeWork. Many of the banks, credit funds, insurance companies and other lenders that make up the commercial real-estate debt market have already financed at least one WeWork building, and are now weighing up how many more they want to do. The concept of co-working itself complicates lenders’ valuation of buildings, especially when one tenant takes most of the property. The mismatch between WeWork’s long-term leases and its short-term tenants could become a problem if office rents fall and customers decamp to cheaper digs. Even lenders that are willing to talk publicly about financing WeWork buildings acknowledge there are challenges. “We don’t do 100 percent co-working,” even if the borrower is willing to pay a higher rate of interest, said Thomas Koentgen, deputy chief executive officer at Deutsche Pfandbriefbank AG, one of the biggest lenders for U.K. commercial real estate. The bank has financed buildings where co-working providers accounted for a smaller share of the rent; Koentgen didn’t say if WeWork was among them. WeWork also runs into resistance because the parent company itself typically doesn’t sign leases. It creates separate companies, known as special purpose vehicles, to handle individual buildings. For lenders in countries, including the U.K. and Germany, whose lending regulations place a heavy emphasis on the credit-worthiness of the company paying the rent, this extra corporate layer is a concern. As a private company, WeWork also doesn’t have to disclose as much financial information as its public rivals, and banks don’t always get all the details they’d like to have when deciding whether to make a loan, according to the executives who spoke about the matter. Much of the available information about the company’s books comes from documents provided to its bond investors. “If we have a top-notch company renting the building and we can be sure that the cash flow is safe for 10 or 15 years, that’s a different thing to placing your underwriting on a tenant whose credit-worthiness isn’t clear,” said Michael Windoffer, head of real estate cross-border business at Hamburg Commercial Bank AG. To be sure, some lenders will consider lending against buildings in a prime location, or where WeWork accounts for a smaller share of the rent, the executives said. Bank of Ireland Group Plc recently made a loan secured against the No. 1 Poultry building, a stone’s throw from the Bank of England in the heart of London’s financial district, even though all the office space is leased to WeWork. The presence of a long-term corporate tenant can also help win over lenders, according to Shawn Kaufman, senior director of debt strategies at Nuveen Real Estate, which has financed two WeWork properties in Europe. Such companies often have a stronger credit rating than the co-working firm itself, making it easier for banks to get comfortable, he said. These tenants account for about 32 percent of WeWork’s customers. 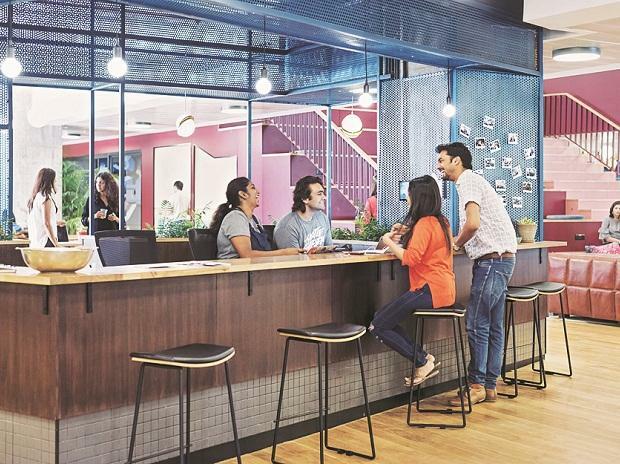 After arriving in London in 2014, WeWork spent years persuading landlords that its brand of fashionably relaxed office design, emphasis on community and pay-by-the-month flexibility would be a winner. It worked, as shown by the nearly 50 properties the company operates in the city. The company is now directing that sales pitch at banks. Part of the pitch is to encourage lenders to look beyond the eye-watering losses caused by rapid expansion to evidence that the business model is working. Existing locations make money, and have an average occupancy rate of 80 percent. Revenue more than doubled last year to $1.8 billion. And ride-hailing companies Uber Technologies Inc. and Lyft Inc., which have also ridden the gig economy wave, show that losses aren’t necessarily an impediment to a high valuation -- and a potential initial public offering. WeWork hasn’t yet given any indication of when it might sell shares.